Back in 2011, at their Adobe MAX conference, Adobe announced the idea of a new offering, dubbed "Adobe Creative Cloud". Very few people (even, dare I say, within Adobe) really had a good understanding of what that new offering was or would be. At that same conference, Adobe also announced that they had acquired Typekit. At their 2013 MAX conference, Adobe formally presented the Creative Cloud offering. Lots has been discussed on Creative Cloud (this post is one example), and my stand has always been that Creative Cloud is a new offering that could be interesting. But that since this is a subscription-based service, and in reality, a shift in many ways, the onus is on Adobe to prove to me that Creative Cloud is worth it. If you compare Creative Cloud to previous editions of Creative Suite for example, the outlook is "cloudy" at best. But moving forward, Adobe is going to have to prove itself by offering ongoing value to its customers. 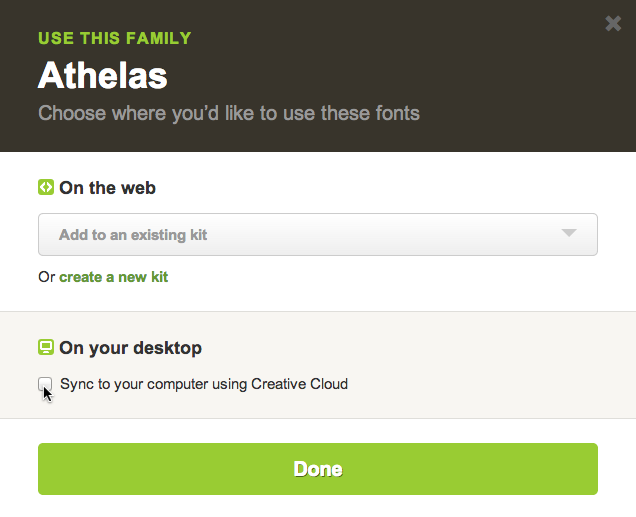 Well Adobe, with today's announcement about desktop fonts coming to Typekit, you've got my attention. Included with your Creative Cloud subscription is a service called Typekit, which gives you the ability to use real fonts on the web. If you do web design, it's actually pretty awesome. (Note to self: If I would take a few minutes out of my day, I should probably give some type-design love to my own blog.) But Typekit has always been for use on websites displayed in a browser. What if you want to use those fonts to design things in Photoshop, Illustrator, InDesign, etc.? Adobe announced today that they are starting to roll out access to their new Desktop Font feature. You can sign up for it yourself here. I was lucky to get an early invite and I tried it out today. More so than simply having access to all those wonderful fonts -- the user experience is phenomenal. I still recall the issues I've always experienced with fonts over the years. You know -- where some formats work in some places, and sometimes one app sees them but others don't, etc. 1. 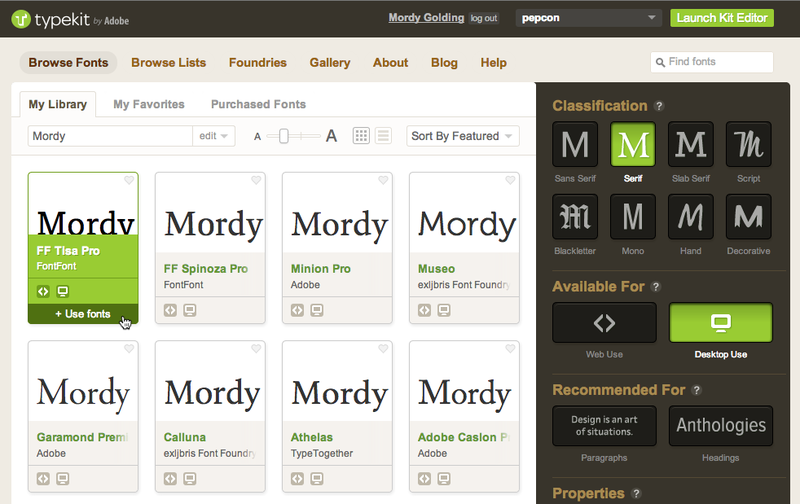 First, you go the Typekit website, which has always been a pleasure to use. 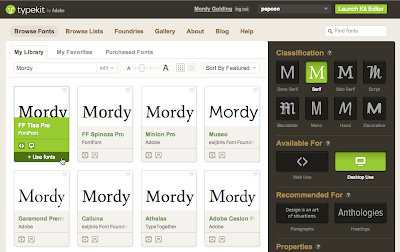 You can quickly browse fonts, preview text, and quickly find what you need. You then click the "Use Fonts" button that pops up when you hover over a font. 2. Next, a window pops up asking how you want to use the font -- on the web, or on your desktop. You just check the box to sync the font to your computer using Creative Cloud and click Done. 3. Third -- well, actually there isn't a third step. Once you perform step 2 above, the font is automagically downloaded to your computer and stored in your system where ALL applications can see and use it (even non-Adobe apps). 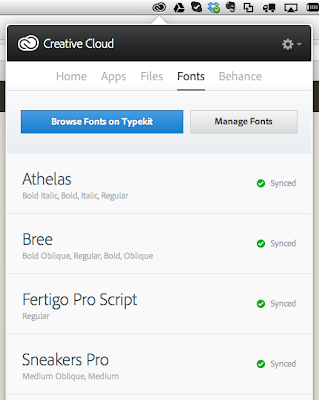 Your Creative Cloud application manager conveniently lists all the fonts that you've synced, and provides quick links back to Typekit's website where you can manage your synced fonts or find new ones. As a designer, you want access to an always-growing huge library of fonts (I said "access" -- not use all at once in a single document). With Creative Cloud you get that, all wrapped up in a no-nonsense package that's easy to use. If this is a sign of what Adobe will be continuing to offer with a Creative Cloud subscription, then I can honestly say that Adobe seems to be taking this idea of providing ongoing value in a subscription model seriously. And I'm listening. I have early access, but still have a huge question that I can't find an answer to (and have contacted Adobe with it as well). Of the 934 fonts listed on Typekit, only 205 show as being available for desktop sync. Will that number increase as it's rolled out? If so, this is a dream come true. If not, it's one of the worst bait and switch scams I've ever seen. Does anyone know the answer? Creative cloud is bad. Subscription to software that makes your files inaccessible at the end of your subscription is completely unacceptable. The language that I've seen used on Adobe's blogs and documents use the word "foundries and fonts that are initially available..." -- so I'm going to assume that more fonts will be added to desktop over time. In my own opinion, it would seem silly if that weren't the case. Of course, much of that is likely out of Adobe's direct control. I mean, they can negotiate with foundries, but ultimately, each font provider has the right to sell its license at its own terms. It's entirely possible that foundries who initially put their fonts into the TypeKit library negotiated one specific deal, but could still be in negotiations with the terms for the desktop sync licensing, etc. Contrary to many, I love CC. $50 a month to have access to the latest version of everything (the CC suite is huge), on 2 computers? I used to spend $1000's a year keeping my agency current. BUT... if every single Typekit font doesn't eventually become desktop-available, it's unacceptable. 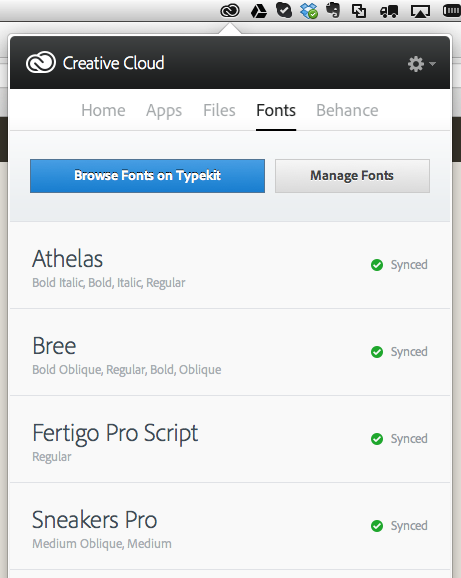 Adobe never said anything about selected or limited fonts being desktop sync. They promised all of them. Once that's available, CC is truly incredible. CC is a scam. If you use it for years, pay thousands of dollars and create work - when your subscription ends you're left with nothing. You won't be able to open all your files. Creative software needs to be licensed perpetually. Subscription-only is for short-sighted fools. I was looking for some illustrator related blog site to read contents as regular basis. & finally found your nice blog! I'll definitely read your post as regular basis. Hi Mordy, am sorry, am about to derail the Topic. I dont know how i else i could contact you to get an instant reply. Am a Big Fan of yours. After searching the web for help on Illustrator, i had to go back to the Video tutorial i bought to check your website again. I have an artwork that's made up of multiple shapes and outlined texts of different colors. And i want to Power-Clip (Clip-Masking) an eclipse shape of 30% Opacity on them all. I have tried using the compound path, it changes the colors to one color and cut out the lower part of the eclipse and it's not reflecting thru the eclipse. Am trying to make a slight glossy expression with the artwork. Thanks Mordy, i 'll be expecting you to get back.